Here we go again. Today we take a look at the next five players on our list of the top 30 players in the NBA today. With superstars like LeBron James and Kevin Durant out of the way, we can really delve into the realm of opinion and I would be genuinely surprised if you completely agreed with me on all these choices as even I second-guessed myself while making these selections. He was once considered one of the top point guards in the league, if not the best. Williams had possessed an all-round skillset that no other point guard in the league had at the time. Without a doubt, Williams was the closest thing to the great John Stockton. Things began to go downhill though as his contract with the Jazz neared its ending. Williams was traded to the Brooklyn Nets (formerly New Jersey Nets) and since then he hasn’t played at the level we saw in Utah. Part of it, however, must be blamed on the lack of talent in Brooklyn as Williams has oftentimes had to share the court with the likes of Kris Humphries, Anthony Morrow and Jordan Farmar as his primary offensive options. I believe that Williams is still a top 15 player in the league and this year with the acquisition of Joe Johnson, resignings of Gerald Wallace and Brook Lopez and the possibility of Dwight Howard, Williams will once again show why he is among the best point men in the NBA. I almost want to place an asterisk beside his name and rank. Andrew Bynum, when healthy, is undoubtedly the second best center in the league. Injury concerns will probably follow Bynum for the rest of his career, but for now, we will push them aside as the big center did play a full season last year. At nearly 19 points and 12 rebounds per game, Bynum is a force inside. No other center in the game with the exception of Dwight Howard has the offense/defense combination that Bynum possesses. It was no fluke that Bynum overtook Pau Gasol as the top option on the Lakers after Kobe, he really is that good. 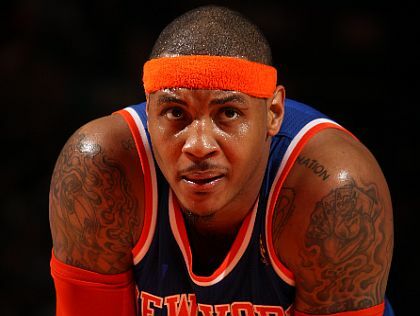 Love him or hate him, Carmelo is still one of the best offensive players in the game right now. His mid-range and post games are incredible, and his late-game scoring abilities have often been overlooked. The lack of success he has experienced in New York will undoubtedly cause some to question Anthony’s abilities, but I believe that the Knicks’ troubles cannot be blamed entirely on the young player. I’m not sure if Carmelo will ever win a ring, as his isolation style offence just doesn’t work deep in the playoffs, but he’ll come close, and will still be unstoppable offensively for years to come. With three starters in the top 15, it is without saying that the Lakers are going to be a force in the upcoming 2012-2013 season. Steve Nash may be the glue to the Lakers’ trio of Kobe, Gasol and Bynum and time and time again he has proven that he is the top playmaker in the league. Guys like Chris Paul and Rajon Rondo may come close, but there really is no current player in the league like Steve Nash. Nash is a deadly shooter and combined with his aforementioned playmaking abilities, he’s the perfect man to run an offensive set. The ‘Kid’ from Canada makes every player on his team better, and that is why he is #14 on this list. It doesn’t hurt either that he is a double digit assist guy night in and night out. I had a very hard time with this one. For me, it was going to be Westbrook or Tony Parker. In the end, however, I based it on how far their teams went in the playoffs and Westbrook did edge out Parker this season with the Thunder winning 4-2 over the San Antonio Spurs. Russell Westbrook is as dynamic as they come. Despite being a point guard, the guy gets to and above the rim on a nightly basis. He is almost impossible to guard as his combination of athleticism and skill is downright scary. This is a guy who while playing the Miami Heat in the NBA finals this year was able to put up over 40 points. He has the ability to take over a game and if not for Kevin Durant, he would be the Thunder’s franchise player. So folks, that is #11-15. Once again, you probably will have disagreements with the choices I have made, but taking everything into account, I’ll be standing by them. Be sure to look out for the next edition of the top 30 players and don’t hesitate to let me know what you think of my rankings so far in the comments below.